Not so much bringing foiling to the masses as opening it up to those ready for the challenge. Surfing a 120 liter sup isn’t so tricky but foiling takes some practice. Foiling on a wave is quite simple an incredible experience, the instant lift of the foil and the smooth glassy speed is an amazing sensation. 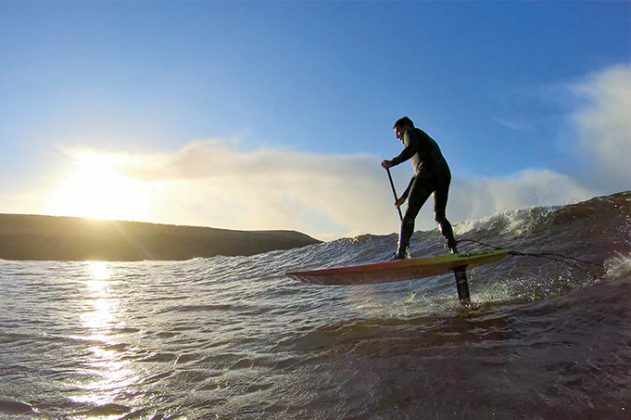 It’s super quick down the line and unlike anything we’ve ever experienced before; the Naish Hover foil makes SUP foiling available off the shelf to the adrenalin-hungry experienced SUP crew. The Hover 120 is as close to the Naish Raptor but with a heavily reinforced twin us box underneath. Our test model (Crossover) also came with windsurfing footstraps and mast track to make it windsurf-able too, all finished to usual refined Naish standards. The foil is a well-engineered removeable rig consisting of an alloy base, mast, fuselage, and fiberglass front and rear wing. The front wing comes in 3 sizes M-L-XL depending on your weight; bigger wings give more lift and are easier to use! The foil is attached with four bolts to the double fin box and can be moved back and forward to create more lift and speed. Designed in collaboration with Kai Lenny, the Thrust Surf Hydrofoil develops lift at low speed and launches with minimal effort. The combination of early take-off and excellent maneuverability makes it great for waveriding, cruising or racing. The extra-long fuselage creates a large sweet spot and provides stability, while the downturned stabilizer (rear foil) makes waveriding and turning intuitive and easy. The small alloy mast can be retrofitted to any style box system. Whether surfing or downwinding, the Thrust Surf Foil will keep you stoked session after session! Naish have been at the vanguard of foiling from day one with the most well-known waterman on the planet (until recently). So, it’s no surprise that this product is so refined and works well. Despite this big step forward in accessibility, foiling is like learning to surf again to a certain extent, so it’s back to the empty, distant corner of the beach. To start with you’ll need to alter your stance over the center line of the board and take off fairly late, once you’re off the whole foil lifts you out of the water and tries to tip you off, it’s like balancing on a chair whilst surfing to start with. However once you’ve mastered the basics, lift and speed and silent fast glide is out of this world, it’s almost like a jet pack flying you along the wave, all the chop disappears and you can pump along on the foil through flat spots and generate speed from nothing. It’s mind blowing once you get to grip with it. The Naish Hover (with the correct size foil) is a total game changer making slopey waves incredibly fun to surf on. Although you’ll be as welcome at a busy beach as a rabid dog, the Naish foil is well worth the walk to be free from the crowds. If you want the ultimate flying machine this season start saving and be prepared for some comedy falls. The Naish Hover has re-written the sensation of riding waves, it’s like surfing with a jet pack once you’ve mastered it.